Street Fighter Exceed is coming to stores in January 2019! 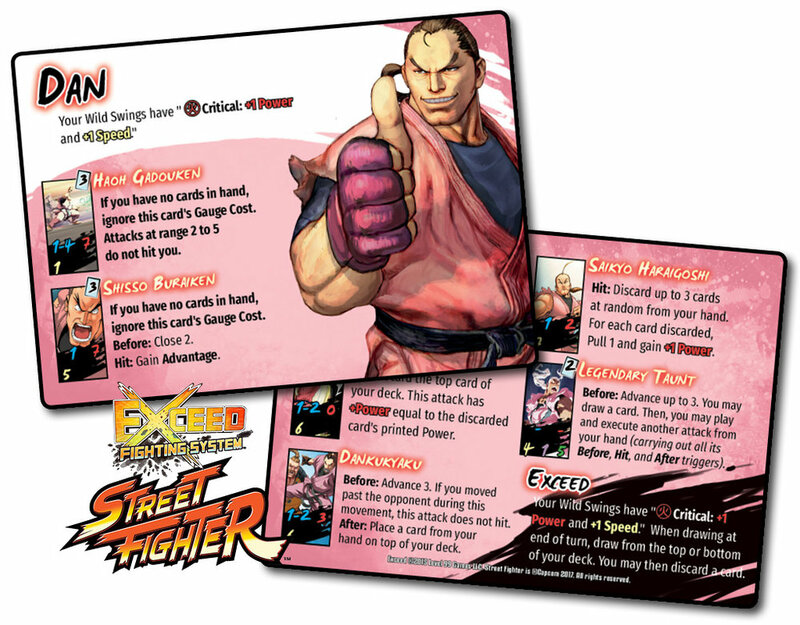 You can pre-order your copy from our online store and get our store-exclusive Street Fighter Exceed playmat as part of the pre-release bundle! Look out for a new fighter preview each week as we prepare for the game's release! Dan isn't the most mainstream Street Fighter character, but there's something innately charming about his frantic, almost accidental style of fighting. In Exceed, we've captured that feel by building around Wild Swings–when a player chooses to attack blindly with the top card of their deck. Or, as we like to call it, Exceed's version of "button mashing". Dan's character ability gives his attacks +1 Power and +1 Speed–if you're willing to commit one Gauge to them before checking what they are! Many of his attacks which are merely OK become incredibly dangerous with this edge. 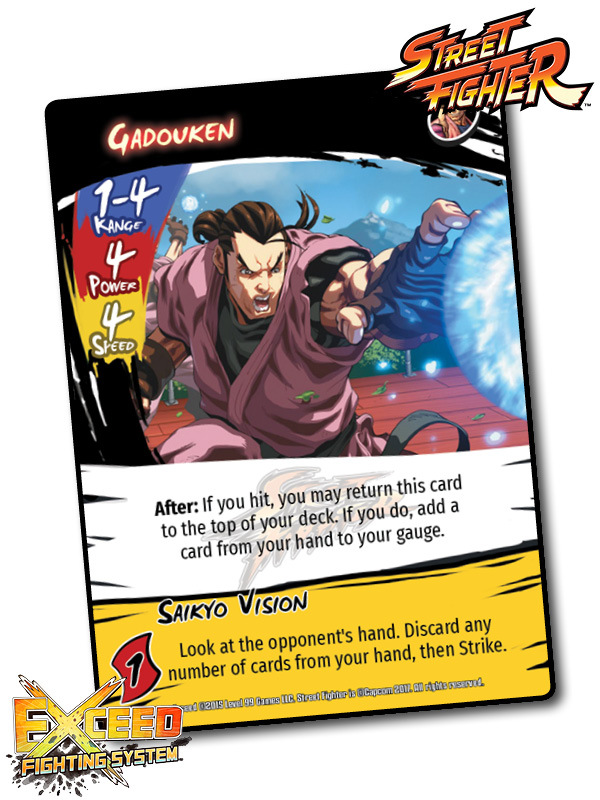 Since Dan plays a lot from the top of his deck, his cards give him other ways to leverage the cards in his hand, such as discarding them to power Saikyo Haraigoshi or moving them directly to Gauge with the Gadouken. Speaking of Gohadoken, check out Dan's projectile attack. True to fashion, it's a short range fireball, which means it can be used in melee too. Dan's ideal range is 2-3, and while it's only mediocre at these ranges, powering it up with his Critical Triggers makes it a real threat that can stomp most Normals at these ranges. Since it's repeatable, you won't be guessing the second time you play it! Dan wouldn't be Dan without the Legendary Taunt! This attack lets him play out a different attack from his hand after seeing the opponent's attack. As long as they're not able to break the huge defense on this attack at Speed 4, Dan can pretty much guarantee a positive trade, at the cost of a bit of gauge. Dan's has two additional Ultra Attacks (for a total of 3!). 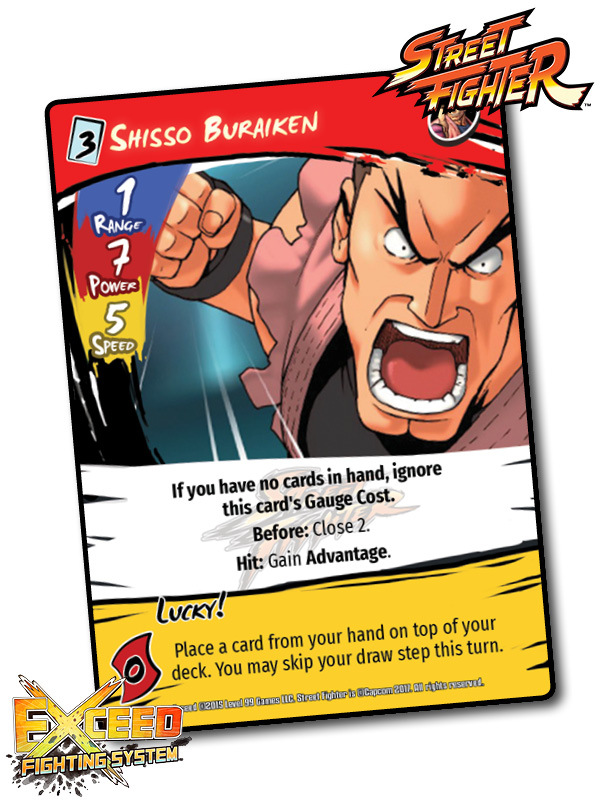 Haoh Gadoken and Shisso Buraiken become free when his hand is empty, further encouraging fighters to spend as many cards as possible on extra effects like movement and boosts. You can use the boost on Legendary Taunt to instantly set up one of these attacks against an unprepared opponent. I hope you've enjoyed this look at Dan! Look out for another fighter next week!